Blackjack is a rare casino game, one where you actually have the chance of winning. While the game still maintains a house edge this can be reduced down to less than 0.5%, giving you a great shot at experiencing a good run and walk away with a profit. This does not come naturally, in fact it is very easy to give up 3% or even 5% to the house, so you have to ensure you play in a disciplined way in order to profit from blackjack. As you begin your journey to winning blackjack you must first understand basic strategy, the basis for reducing the houses edge in blackjack. Then you can find out about certain bets which you should avoid and card counting, the only real way you can move the odds in your favor. Finally bonuses and comps are covered to see how you can profit after you are away from the table. While most people know it is wise to stick on 17 or higher and hit on anything lower than an 11, basic strategy gives you the answers to the marginal spots, such as do you double when the dealer is showing a 7 and your hand totals 9. When you are getting these decisions right you can reduce the house edge to less than 1%, although get them wrong and you could give up 5% or more. Basic strategy is no secret and even though it will significantly reduce the house’s edge you can easily find strategy cards sold in the casino’s shop. Some casinos even let you refer to such cards at the table, after all the house still maintains an edge, although to keep the game flowing and to avoid misunderstandings it is best to commit them to memory. While there are times when you can break from basic strategy, it is best to stick with them especially when you are starting to play the game. Mistakes made by not following basic strategy when you should are greater and heavily out-weigh errors made by sticking with it. If you aim to continually play against a low house edge, you will need to avoid different side bets. Sometimes these bets are obvious, like when there is a chance to hit a progressive jackpot, although many people take the most common side bet, available in nearly all blackjack games without really understanding it. 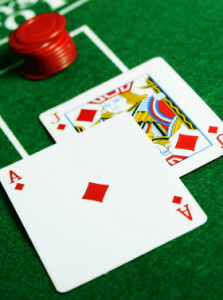 Insurance is not, as many believe, protection of their initial bet in case the dealer has a natural blackjack. Instead it is simply a side bet, half the size of your initial bet, which will win at odds of 2:1 if the dealer has blackjack. By taking these bets all you are doing is simply risking more against the house, when the odds are against you. Even by playing perfectly and avoiding side bets you will still give up a slight percentage to the house. Card counting can reverse this edge and bring the odds around into your favor. This is done by keeping track of the cards coming out and increasing your bets when the remaining cards in the deck work in your favor. Unfortunately this is the most common and widely known advantage players will try to take in the casino and they are clued up on it. Because card counting relies on large swings in bet sizes it tends to stand out, especially when you start winning! While the practice is not illegal, or even against the rules of the game, casinos do not like the odds in the players favor. If caught will usually be asked to leave the table or even the building, which security or casino employees are well within its rights to do as the casino is private property. Even if you play the perfect basic strategy and avoid insurance and other bets on offer, the house still has an edge over you meaning it will eventually win overall. The easiest way to decrease this edge even lower is to take advantage of the Comps scheme offered by the casino and profit off the table. When playing live you will usually build up comps points which can later be exchanged for food, drinks or even accommodation. If you are playing high limits, get in touch with the casino’s host and talk over you plans to see what they can offer you. Depending on how big you play they can sort out tickets for shows, luxury rooms and private transport to and from the casino. Online the different blackjack bonuses and promotions are constant. Like live casinos you can find comps and loyalty schemes on nearly all sites where you earn points as you play which can later be traded for cash. The most obvious perks however are the bonuses. You can initially get a welcome bonus which matches your first deposit and sometimes doubling or even quadrupling the amount, and there are plenty of juicy reload bonuses after this. They all require a certain amount of play, which can vary a lot so make sure you shop around for the best deals.